We wish to decorate our home to enhance its beauty. Dining room is one of the most important rooms in a home. It is the place where we share our meals, parties, and hold some discussions. A comfortable and unique decorated dining room is therefore important to have a happy get-together. A well decorated dining room uplifts mood of the members giving the best dining experience. Here are some ideas for decorating a dining room. Decorating a dining room is not that difficult. A beautifully decorated dining room can be made by using your creative skills. You need to choose a particular style for decorating the room. Decide the style you want whether it is formal, casual, traditional, or modern. When you choose formal or casual styles, you can use neutral colored palettes. Modern dining rooms can make use of hard colors such as black and gray. You can make use of calming colors such as blue, yellow, green, and neutral colors for dining rooms. A lighting fixture that is appropriate to the space in the room should be selected and hanged. You can better use chandeliers which give a beautiful look for a dining room. The fixture should be selected in such a way that it matches the design and color palette of the room. You can hang curtains, shutters or blinds over windows. Curtains give finishing look, hence chose appropriate colored curtains for windows of your dining room. Valances and cafe curtains are considered to be the best for dining rooms. You can also use sheers which give a light and airy feel. Apart from the dining table, you can add furniture such as a hutch, China cabinet or buffet. Decide the type of furniture you desire to have in the room before purchasing a dining table. You can have a smart dining area by attaching bold botanical wallpaper. With the trailing leaf designs of the wallpaper, contrast dark furniture can be used to further make the room elegant. Creative light structures with dimmer switches add beauty along with illumination in nights. Different kinds of display items in the cabinet like dishes and flatware may also be a part of decoration. A wide range of dividers such as glass, hangings, and waterfall can be placed in a dining room. 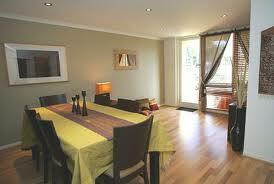 A dining table is one of the most important components of a dining room. It is therefore very necessary to decorate a dining table for getting the attention of your guest stuck on its beauty. Here are some things that should be considered for decorating a dining table. Adding place mats and table cloths is an easy way to add instant style to a dining table. A variety of fabrics like silk, cotton, rayon, organdy, jute, polyester, satin, and so on can be used as table cloths. You can select a printed, designed, hand knitted, plain, or handmade embroidery styles of table cloths. Table cloths can make your table look nice and also protects from the table from scratches and dirt. Place mats of different materials like jute, cotton, linen and others can be used with different patterns such as floral and geometric prints. You can make use of jute and straw table mats as they are environmentally friendly. An ornamental appeal can be given by use of cotton and linen table mats. Different natural decoration items can be placed on the table. You can make use of vases with fresh picked flowers from your garden. They make a cute centerpiece for the table. You can place certain fruits, lemons or limes in a bowl at the center of the table. Place some China pieces and settings on the table to add decor to the table. You can create a magic mood within the home by placing candles at a dining table. Inexpensive candles can be placed in a row or a circle on the table as a centerpiece. You can also place candelabra as well. Tapering or short pillar candles are used for decorating the table for informal dining. Make use of attractive candle holders for placing candles. These days’ people are using floating candles which are pretty. Place the floating candles in transparent containers to enhance the beauty of the table. You can decorate a dining room in many ways based on your taste, style and skills. You can make use of items which are already present in home to decorate the room. A well decorated room gives a beautiful look and also drags the interest and attention of your guests.